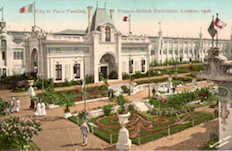 The Franco-British Exhibition of Science, Arts and Industry was held in London between May and October 1908 at the initiative of the Chambers of Commerce, both the London one and the French one in London, to reinforce the "Entente Cordiale" which had been signed by Britain and France in 1904. The project was underpinned by Imre Kiralfy’s project of a permanent exhibition site in London. The French Ambassador, Paul Cambon (signatory of the Entente Cordiale and founder member of the Alliance Française in Paris) relayed the idea to the French government which agreed to get involved and finance part of the project. At the same time the idea of a channel tunnel was mooted. Ambassador Cambon liked the idea : "I regard a future Tunnel as one more bond between our two countries, as an instrument of reciprocal penetration which wil help us to know each other better.[...] I have always considered a good understanding between France and England as one of the essential factors of European peace and of general progress." (speech at the dinner of the FCCL on 6th May 1905). 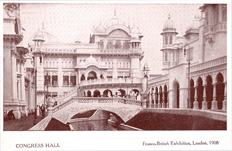 The Franco-British Exhibition appeared in 1908. A tunnel took a while longer to organise. Imre Kiralfy, a famous exhibition organiser in his time and “permanent counsellor of the British government for foreign shows”, also member of the London Chamber of Commerce, was a key figure in the craze for public exhibitions in the early 20th century. As Commissioner-General for the Franco-British Exhibition, he developed the exhibition grounds on farmland on 140 acres at Shepherd’s Bush where he built the Great White City and Stadium. The stadium was a last-minute addition when London took over hosting the 1908 Olympics. The White City was named for the white plaster finish of its building exteriors in “wedding-cake style” but despite the overall whiteness of the fair, the two organising countries of the first exhibition held there, that of 1908, had different architectural styles. There were some 120 exhibition buildings and 20 pavilions, most designed in an Oriental style, with domes and arabesque arches. They were linked by a network of roads, bridges, and waterways, and centred around an artificial lake. The halls included French and British Palaces of Industry, a French Artisan’s Palace, the prominently-placed Palace of Women’s Work (celebrating famous figures from Elizabeth I to Florence Nightingale), a Fine Art Palace (with paintings by Hogarth, Gainsborough, Corot, Courbet…), huge Machinery Halls etc. In the Garden of Progress, the Pavilion of the City of Paris was said to give one “the reposeful pleasure always attending the contemplation of a pure work of art.” A number of model villages were reconstructed to celebrate imperial achievements, such as Ballymaclinton, a “genuine” Irish village, and a French Senegalese village, with live attractions! There were also cafés, restaurants and funfair rides. Two stations of the Underground were built to serve the exhibition and the games and survived long after (the old Wood Lane and Shepherd’s Bush stations). Numerous special trains were organised from all over the country and also to ferry visitors from France. Meant initially as a trade fair, it was also undeniably a fun fair, with a lot of music all around and several exciting attractions, notably the famous flip flap. The exhibition, the largest of its kind in Britain, attracted some 8.5 million visitors from all over Britain and France, with a wide social mix. It was even a financial success with receipts of over 420,000 pounds! On Saturday 18th October 1908, the first official event of the Alliance Française in the UK (whose London group had started meeting in 1884) took place at White City, in the Congress Hall: it was a lecture “with lantern slides” given by a Dr H. Lorin, Professor of Colonial Geography at Bordeaux University, on the theme of “La France et la Civilisation Française en Algérie”. The Alliance française also held a banquet for its members that same evening in the Garden Club, followed by French recitations and songs. It is there that it formalised its workings and elected its Chairman. To mark the centenary of the Franco, as it was affectionately called, and the fact that it played such a part in the development of the Alliance Française in the UK, we have put on display some commemorative artefacts and postcards for the benefit of our students in our language centre at 1 Dorset Square, NW1. And the Illustrated Review of the Exhibition is available for their consultation. 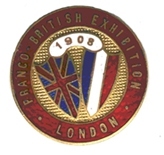 Replica of a commemorative lapel badge of the Franco-British Exhibition on sale at the Alliance. 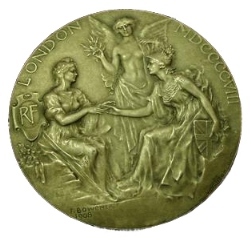 The impact of the Exhibition was soon drowned in the chaos of WWI but the success of the 1908 Olympic Games contributed to the Olympic movement becoming a worldwide spectacle with international cooperation, quite a timely reminder when London prepares to welcome once more the Olympic Games in 2012. Pour la petite histoire, it was in London in 1908 that Pierre de Coubertin famously said that “L'important n'est pas de gagner, mais de participer.” Also, Arthur Conan-Doyle was reporting these Olympics for the Daily Mail; it was the first time gold, silver and bronze medals were awarded and Kiralfy’s own son was a 100m sprinter on the U.S. Olympic Team. The modern marathon distance was established in 1908 when the starting line was moved to Windsor Castle to allow the Royal Family a good view: the distance between the castle and the White City stadium of 26 miles 385 yards has been since become the standard. Quite memorable Olympics then; quite a memorable exhibition too! © CH 2008. This page is an extract from research in progress. You are welcome to quote any of the above and it will be appreciated if you would kindly acknowledge this research and include a link to this page.